You know, I don't seem to post very often. This particular one I've actually been meaning to do for quite a while; I started back in mid-June. I even finished writing it a week ago, but I just have had trouble making the time to post it. I actually have some 15 posts in various stages of completion right now, but I just cant seem to get around to finishing any of them up. Ah well. If you're reading this, that means that this one actually got posted, so I suppose that's a win for me. As you may be aware, I absolutely love story-driven games (see Alan Wake), and one of the places that you can find an abundance of stories is in the indie game sphere (see To the Moon). A while ago, I heard rumblings in the video games community about this game called Dear Esther, and decided that it was the exact sort of game that was right up my alley. I picked it up, gave it a playthrough, and enjoyed it for what it was. A little while later, I heard about a Source mod called The Stanley Parable, which seemed like it fit into the same general category, so I downloaded that and ended up enjoying it immensely. Now, a year or so after finishing those games, I've been hearing about Gone Home, another similar game (which I've now played). I've decided to label this style of game as a First Person Indie Wanderfest, because this is basically what the whole game is like: it's from a first person perspective, and as you walk around the carefully crafted environments, a narrator talks based on where you are and what you're looking at. That's... really all there is to it. I figured that this would be a good time to give my thoughts of these games, going through them in the order that I played them. The first buzz that I remember hearing about this was people asking the question "Can this really be called a game?" because it's so different from what is normally considered a game. Perhaps the biggest difference is that there's very little player input in the entire experience. Maybe that's what I'll call it rather than a game: an experience. The entire time that you play it, the only thing that you're doing is walking to the next area. You can look around at the environment (and you really should), but it's not necessary to proceed at all. You just spend your time following the path. Really, the only thing that you can gain story-wise from the environment is some help deciphering the metaphor. Maybe. That's what this game is though: a metaphor As you wander, the narrator slowly gives you more and more hints about what's really going on, but they're all super cryptic and worded in the most unintelligible way possible. Seriously, no one talks like that. Personally, I thought that was the biggest flaw in the game; it's so pretentious. It's a metaphor, it knows it's a metaphor, and it shoves it down your throat that it's super clever and using symbolism to tell the story, rather than being upfront about it. It's kind of obnoxious. There's a lot of biblical symbolism used, specifically with Paul's trip to Damascus where he is blinded. While not quite at the level of Neon Genesis Evangelion's absurd symbolism, it's still pretty up there. Dear Esther isn't a very long experience to play through. I got through the entirety in ~1 hour, which makes it the shortest of the three games in this post. It could have been slightly shorter if I had gone on the shortest path every time, but instead I tended to explore everywhere I could. That's what makes the level design good, but not fantastic. As you're walking along, occasionally the path with fork, and you have to choose which way to go. Both paths usually end up in the exact same place eventually, but one will be significantly longer and will eventually reach a dead end with a short little bit of narrator voice over that will be triggered, at which point you'll have to turn around and backtrack almost all the way to the split in the path. Not only is the amount of backtracking in this game obnoxious, but it's also never clear which way is the short way and which is the long way, and by the time you realise that you took the shorter route and may have missed a narrator clip, you don't feel like turning around and walking back. This may be a First Person Indie Wanderfest, but the wandering isn't actually all that much fun in itself. Your movement speed is just slow enough to feel sluggish, and most of the time there's not much to do while moving around. The experience suffers from how heavily scripted it is, with its audio cues triggered by the player's location. For some reason, the soundtrack songs aren't set up to loop, so while travelling between script locations, you can take too long and actually have the music run out, resulting in long periods of silence while you trudge along. Sometimes there are things to look at to break up the boredom, but mostly not. On the flip side, the best part of the game is the visuals. Most of the island that you're on isn't too exciting to look at as it's simply grass and rocks, but at least the grass and rocks look really good. But later in the story, you suddenly go inside the island, underground, and everything is beautiful. There are rock formations everywhere, glistening in the damp air as the otherworldly blue light from the cave fungi reflects off them. The water flows down the cave walls, forming pools and streams and waterfalls that catch the light in the most beautiful of ways. It's probably the prettiest looking game that my 5 year old computer can run. Apparently it won the 2012 IGF (Independent Games Festival) award for Excellence in Visual Art, which I can totally believe. It's so pretty! Just look at that! 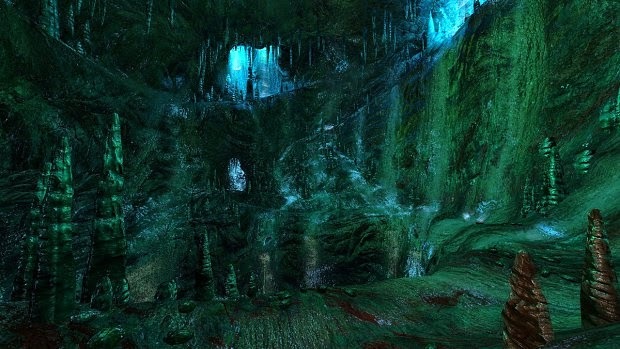 Dear Esther is a very player-driven experience. If the player isn't ready to move on the the next area, the game will wait, changing absolutely nothing (and, like mentioned above, not playing music) until the player is ready to continue. If the player decides "You know what? I think I'm going to walk off that 200ft cliff" to see what happens, they can do that. There are no invisible walls to protect the players from their doom, so if a player dies, they're just reset to where they were before they went off the cliff. There aren't really any cutscenes either; as soon as the game begins you can look and walk wherever you want. Your goal in the game is to reach the radio tower, and when you finally do at the very end, control is suddenly taken away from the player, never again to be returned. It's a little jarring, and doesn't really fit in with the rest of the experience. Not going to lie, I was a little disappointed. This game was originally a Half Life 2 mod, but was redesigned and released as a stand-alone game through the work of pretty much a single man, Robert Briscoe, which is quite impressive. You can read about his experience of making the game here, and you can pick up Dear Esther for yourself on Steam here. It's certainly not my favourite thing ever, but it's well worth picking up if this is the sort of thing that you're into. You may have heard about The Stanley Parable recently. It was one of the first games that was greenlit for Steam, and it was finally released in October of last year. 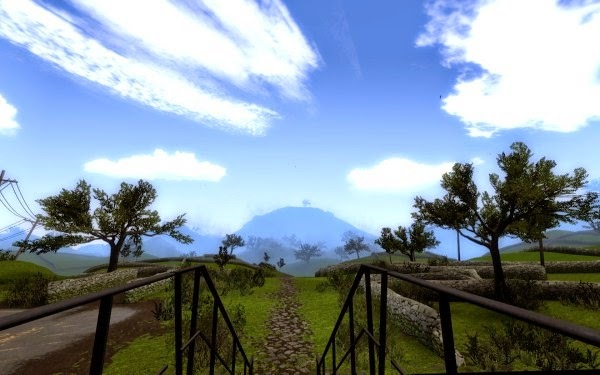 This isn't the first version of the game though; similarly to Dear Esther, it was originally a Source mod. The original version came out in 2011, and unlike Dear Esther, I actually played that version. I enjoyed it quite a bit, so when I saw there was a new version on Greenlight, I knew immediately that I would end up buying the new version whenever it was released. It took me almost a year (well, 9 months), but I did eventually get it. If you haven't played the Source mod version of the game, I'm not sure I'd recommend it to you. Yes, it is very good and I enjoyed it a lot, but the newer version is really the same game, just greatly expanded. Many of the paths through the game follow the same general thread in both versions, so if you play the Source mod, you'll more or less know what's coming on these paths. It was fine for me because enough time had passed between playing the Source mod and the newer version that my memories of the paths had grown hazy. If you play them in too close proximity to each other though, you'll definitely get the same experience twice. You may think that you want to try out the free Source mod before dropping money on the full game, to see if you enjoy the experience, but if that's your plan I would highly recommend playing the demo of the full version. It contains everything that you can expect to find in the game while having exactly zero content from the full game in it. Actually, because of that I would recommend playing the demo anyways, because it's a pretty fun experience by itself, and you won't find the content in it anywhere else. Promo art for the game's remake, making it perfectly clear what the game will contain. 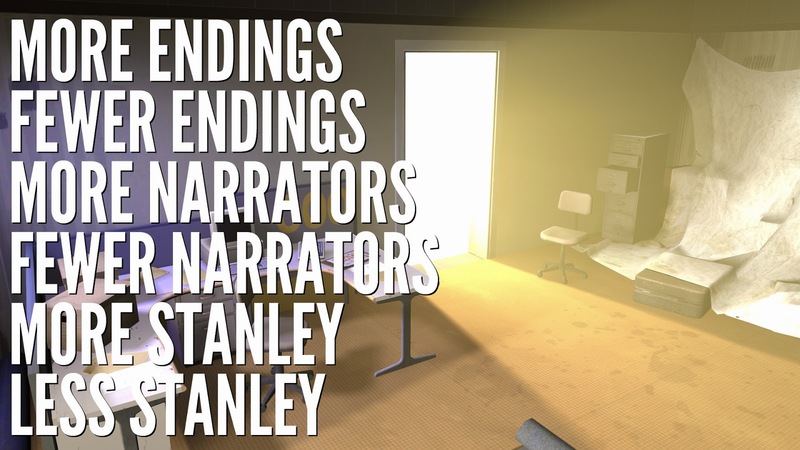 The Stanley Parable, if you don't know anything about it, is known for two main things: the narrator (and his sense of humour), and its exploration of choice in video games. I absolutely love the narrator, and I'm not alone in that sentiment. He's so popular that a voice pack was even released for the DotA 2 announcer that's simply him making sarcastic comments (which is exactly what he does as you play through The Stanley Parable). The game is about Stanley, an office worker with a menial job who one day realises that he is not receiving any more instructions and all of his coworkers are gone, so he decides to leave his office to find someone to tell him what to do. As you follow the path, there will occasionally be branches, and the narrator will tell you what to do. You can then choose to follow the narrator's story, or to ignore him. It's a fascinating setup for a game, but it could easily fall flat if the narrator was weak. Fortunately, the narrator is possibly the strongest part of the game, and is absolutely hilarious and fun to listen to. Possibly my favourite part of the whole game was when, while I was just following the path, I saw a door labelled "Broom Closet." I was intrigued, and decided to see if I could open it. To my surprise, unlike most doors it actually opened, revealing a tiny room filled with cleaning supplies. I entered the closet, which flustered the narrator who wanted me to continue the story. The longer I stayed in the room, the more he complained, until he eventually assumed that I (the player) had died, because there is no other reason that I wouldn't have left the room. He would wait for another player to come to the keyboard and take control so that the story could continue. That's the kind of humour of The Stanly Parable: very meta. I've actually done my own exploration of choice in video games, which you can read here. The game's creators use the narrator to great effect for their exploration of choice. Like I said before, you can always choose to follow the narrator's directions or to ignore them, and no matter what you do he always has something funny to say. That's actually one of the most amazing things about the game: the narrator is always there. The designers planned for every contingency, every way that the player may try to break the game and get out of the story. If you go left instead of right, the narrator has something to say about that. If you try to quickly backtrack through the closing door so that you end up trapped in the previous area, the narrator has something to say about that. If you break the map and end up escaping the normal area, the narrator has something to say about that. The amount of planning that was done to cover all of those bases is phenomenal. Eventually, you run out of choices to make and you reach one of the endings. I don't want to spoil anything, but one of the endings has the narrator taunting you as you die, another has the narrator lose control of the story and descend into madness, another has the narrator give up on the story and try to write a new one for you on the fly, and there are many more. My personal favourite has a fairly profound observation in it: the narrator says that the only real choice that we have is to not play the game at all; to hit the escape button and quit to break free of the narrator's power. You know what? In a way that's true. Like I said, the narrator is at every corner in every route. Nothing can surprise him. Everything has been planned for. There is no real choice in the entire game because you can do nothing that the narrator hasn't already planned for. Quitting the game is the only way to defeat him. It's a fascinating idea at least. The only way to win is to go outside? Perish the thought! This same ending also includes a museum in the middle of it, where each of the exhibits is a piece of the "The Making of The Stanley Parable" picture. There are pieces of concept art, mock-ups of early level designs, and promotional posters and trailers on display. The already meta nature of the game allows them to include this information in the game's story without it seeming like too much of a stretch to be there, while also being a very effective look into the design process of the game. Every piece on display has a caption that provides further insight. I'm quite fascinated by the process of making games, so actually finding this information included in the game was very exciting for me. I'm not entirely sure why the designers decided to do that, but I'm completely ok with it. Of the three First Person Indie Wanderfests in this article, The Stanley Parable is definitely my favourite. The unique sense of humour, the meta presentation, and the genuine exploration of a common video game element make it stand out in my mind. If you haven't played a lot of video games, it's probably not the best game for you to start out with, because you're not the target audience so you'll miss a lot of the deconstruction of video game choice that it does and may not end up enjoying the game very much as a result (although the narrator will still provide an awesome experience). If it sounds interesting to you, you can pick it up on Steam here, and don't forget to check out the demo as well. Also, I super recommend checking out the development blog. Not only is it insightful, but it's hilarious! My personal favourite is this post on making mistakes. Beware of strong language though. This is not in-game graphics, unfortunately. Gone Home is a game that got quite a bit of press back when it was released, right around this time last year. I remember seeing articles about it back then, and my interest was piqued. Although I'll admit that I do put way to much stock in these things, I also noticed that it had an 86 on Metacritic, which only made me want to play it more. Metacritic has caused its fair share of problems, but I still find it a super valuable resource for choosing what media I end up consuming. Indie games do seem to have higher than average scores on Metacritic, which I assume has something to do with the fact that reviewers will probably only review a small indie game if it was outstanding in some way, leading to a skewing of scores away from the standard average. Well, for whatever the reason, Gone Home was doing well on Metacritic, so I wanted to check it out. The reason that Gone Home was generating so much critical buzz was due to its story, although not in the usual way. Most of the time when someone says "because of the story" they mean the narrative; what actually happens. Gone Home doesn't have that amazing of a narrative. It's actually fairly simple, and very little happens. In itself, it's not even that exciting. What makes Gone Home's story special is the way that it's presented. Most games present their stories through cutscenes (interactive or otherwise) where the player is simply an observer. Not so with Gone Home. Instead, the story is presented in two ways simultaneously: through the narrator, and through the environment. The narrator handles the main components of the story; the parts that no one should miss, while the environment handles the subtle details that really give the story its human, realistic element. 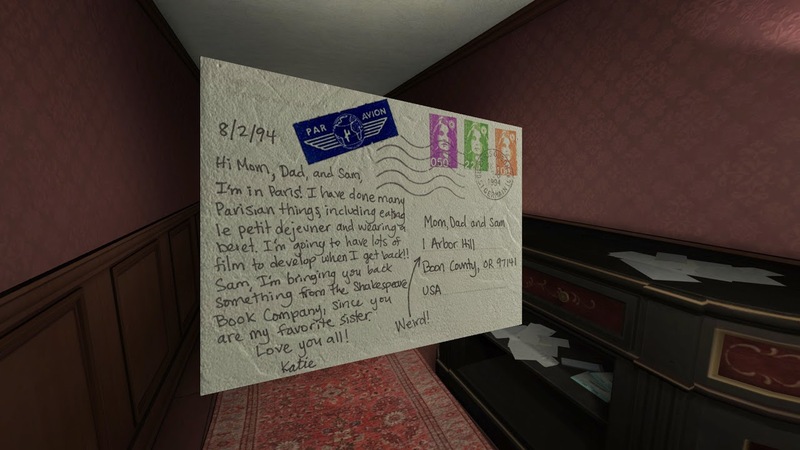 Basically, the story of Gone Home is that of a broken family. The character that you play as is the oldest of two daughters in this family, who has just come home from travelling abroad in Europe for a long time. The house is empty, so you explore. As you poke around, you interact with certain objects that trigger the narrator, the voice of the younger daughter Sam. She reads entries from her diary, and as the game progresses and you explore more and more of the house, you eventually learn what's happened in the time since you left, and why the house is empty. Sam the narrator takes care of the big picture story, filling us in on what she's been doing and how she's been feeling. She handles all of the heavy lifting for the emotional core of the story. But as you explore the house, you start to fill in the gaps in the story that Sam is telling with the things that you observe. Really, that's the coolest part of the game's storytelling. It doesn't hold your hand; if you want to know the full story, you need to pay attention to everything around you. Open every drawer. Move every book. Check every scrap of crumpled paper. Sam's narration only really tells you about herself; to find out about the parents, the only thing you can do is observe. When you're in the father's study, you can see that he's reading a book on how to understand teenagers. When you're in the kitchen, you can look at the calendar and see what event is scheduled for the day the game is set on to learn why the parents aren't home. It's those kinds of subtle details that make this game so enjoyable. You can tell that the developers worked really hard to craft this game as tightly as they did, and it really payed off. There's a lot of picking objects up and turning them around to inspect them. As for how I feel about the actual story itself and the message that it's trying to get across, let me just say that I think that all parties involved could have handled the situation better. Sam and her parents don't really understand each other very well and they fight a fair amount, with things eventually reaching a breaking point. Maybe it's just because it's the kind of guy I am, but I just don't understand Sam. I mean, her parents are definitely in the wrong too, but I can understand their perspective better than I can understand Sam's. It all ends up in a very messy situation that I'm sure happens a fair amount in real life, which only makes it more sad. I was left at the end of the game with a profound sense of disappointment with all of the characters, particularly Sam. I recognise that she's just a teenager, but she's still way too impulsive. Hopefully that family can be healed in the future. That's what happens in my head-canon anyways. Honestly, I'd say this is my second-most favourite of the three games. I felt like it had more substance to it than Dear Esther, but it wasn't quite as expansive (or amusing) an experience as The Stanley Parable. If you're a fan of environmental storytelling, this is definitely the game for you, or if you like realistic stories of heartbreak and broken families rather than a more fantastical setting that serves as metaphor. If you're interested in it, you can buy it on Steam here. So, that was my look at the three First Person Indie Wanderfests I've played. The games are all similar to each other in some pretty significant ways, but still different in just as many ways. If I had to classify them, I would say that Dear Esther is narrative focused, The Stanley Parable is choice focused, and Gone Home is character focused. The were all created for different purposes with a completely different intent behind them, yet they all incorporate some of the same major elements: a first person perspective, a focus on exploring, and a narrator to get the point across. I probably won't buy any more PC games for a while now though. My laptop is still crying from the effort of trying to run these games, so I think I'll give it a break.